It was a beautiful sunny day today, but unfortunately it felt like -28°C (-18°F). I couldn't stay out too long, but I needed to see the sun. A little sun on my cold face was better than none at all. 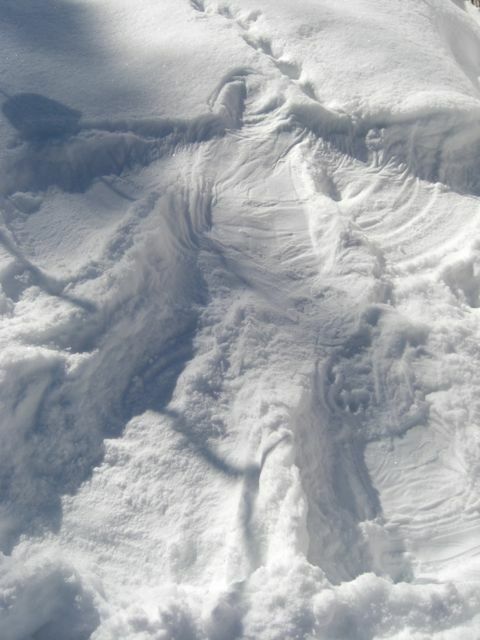 I don't have snow pants but I went ahead and made a snow angel. It was quite enjoyable, actually. I also became a scientist for a few minutes and did the experiment to see what boiling water does when thrown into cold air. There is a great summary of people trying it out here and here. Apparently some people who try it burn themselves, so if you try it, don't burn yourself! Here is my attempt at it this morning. It was only -20°C but it still seemed to work. Tim did that when he was a kid, toss the boiling water up in the air. Such a weird but fun thing. Snow angel by the way, brilliant. Meanwhile, I'm drinking a cinnamon mocha latte. Made it today, not so great. Normally I take my lattes without coffee. Going back to that, tomorrow. Snow angel was fun. The sun was shining just right. If I had snow pants I would have lied out longer. I prefer grass under me than snow, but... I'll take what I can get! Spring will hit, what in like three or four more months??????? I love it! Making angels in the snow. What a wonderful way to keep your heart forever young! Good for you. It was sooooooooooooooooooo cold yesterday my face felt like it was on fire. I'm not as bold as you are with the boiling water experiment. Be careful. Cheers!! I will have to try - those shots are beautiful!